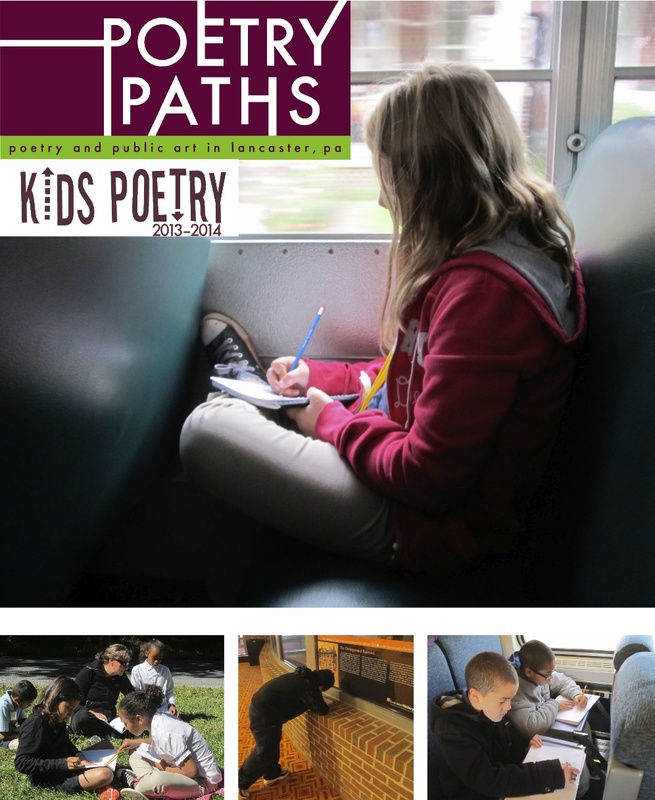 Each year Poetry Paths offers poetry workshops and enrichment activities for over one hundred schoolchildren from the School District of Lancaster. We invite you to celebrate this year’s young writers from Hand Middle School, Martin School, and King Elementary School! 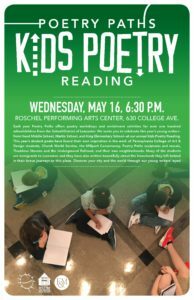 Please join us on Wednesday, May 16, 6:30pm at the Roschel Performing Arts Center at Franklin & Marshall College, 630 College Avenue, Lancaster, PA.
Our student poets have found their own inspiration in the work of Pennsylvania College of Art & Design students, Church World Service, the Millport Conservancy, Poetry Paths sculptures and murals, Thaddeus Stevens and the Underground Railroad, and their own neighborhoods. Many of the students are immigrants to Lancaster, and they have also written beautifully about the homelands they left behind in their brave journeys to this place. Music will be provided by the Music for Everyone String Ensemble, and there will be a reception following the reading. We thank the following companies who, by supporting F&M via contributions through the Commonwealth’s Educational Improvement Tax Credit (EITC) program, have supported Poetry Paths in the Schools 2017-2018: The Bryn Mawr Trust Company; Fulton Bank; Fundamental Labor Strategies, Inc; Oak Tree Development Group; Phillips Office Products; and Warfel Construction Company. 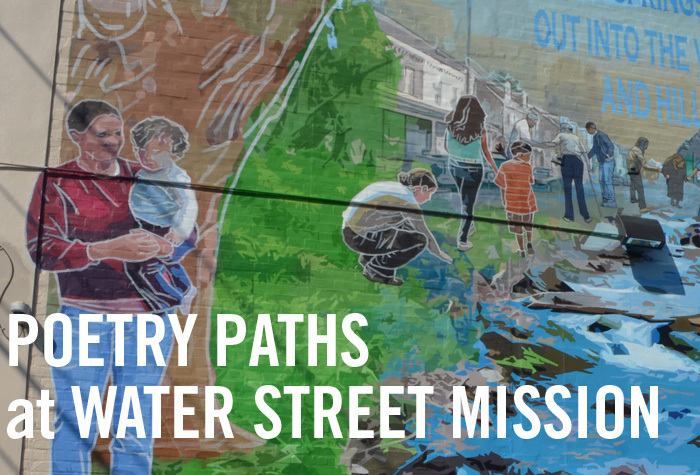 We’re thrilled to announce that the latest Poetry Paths artwork, a mural by Jared Bader, has just been installed at Water Street Ministries. Here is the link to the article about the mural in LNP. and schools, cars and bikes. fruit in the stores here, too. It makes me happy to see that. throwing snowballs at each other. white, and pretty as I thought. 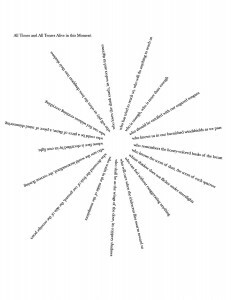 2014 marks the fifth year that we have worked with Barbara Buckman Strasko, our Poet in the Schools, to offer excellent poetry writing workshops annually to about 250 public elementary and middle school students. In preparation for the workshops, we also sponsor experiences for the students that give them a new and deeper appreciation of their neighborhoods and provide inspiration for their poems. At the end of each program year, we publish a journal of the kids’ poetry and host a large public reading of their work for teachers, principals, students, families, neighbors and friends. 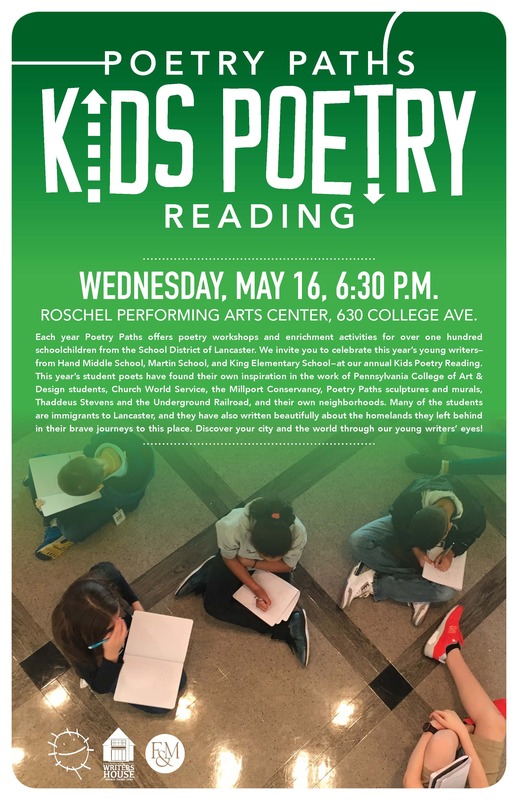 The reading by our young poets from Washington, Fulton, and Ross Elementary Schools and Reynolds Middle School was held on Thursday, May 1 at the Roschel Performing Arts Center at Franklin & Marshall College and each student received a copy of the journal. Gretel and Arthur B. Dodge, Jr. Poet Mary Szybist wins the National Book Award in Poetry for her collection of poems, Incarnadine. 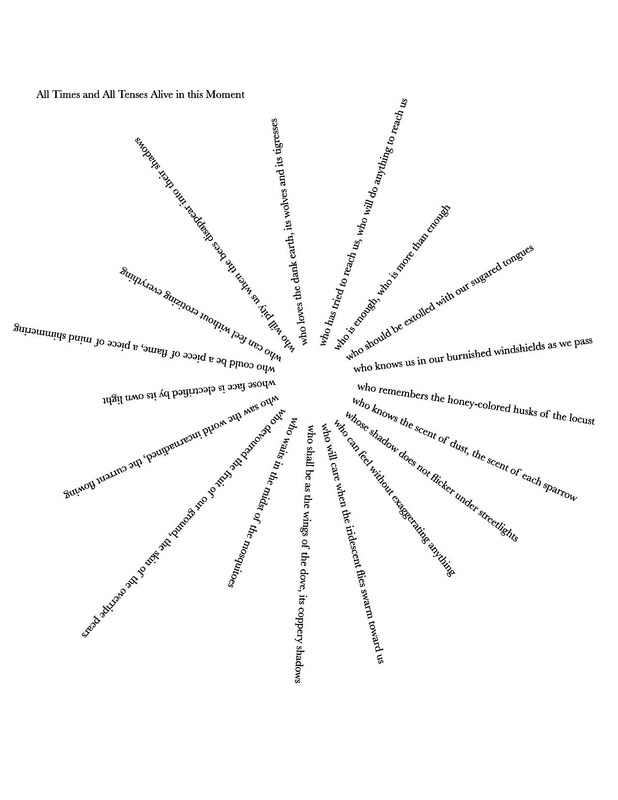 Mary’s poem, “All Times and All Tenses Alive In this Moment” appears in the book. 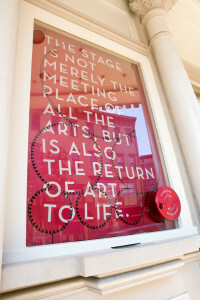 You can find this poem here, and at the Poetry Paths site at Pennsylvania College of Art & Design. 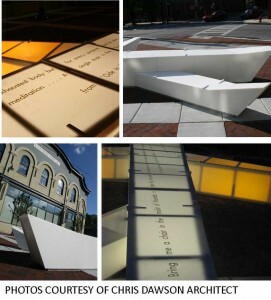 Chris Dawson Architect receives a Citation award for the Excellence in Design Competition from the American Institute of Architecture for his project, “Eastern Market Bench.” You can find the bench at the Poetry Paths site at Eastern Market. 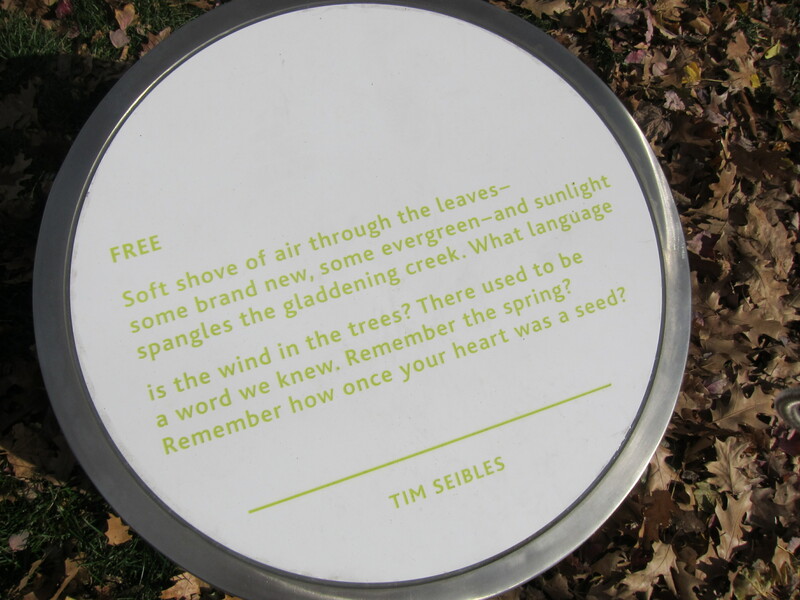 Tim Seibles is named a National Book Award Finalist for his book of poetry, “Fast Animal.” You can find his poem, “Free” below or visit the Poetry Paths site at Fulton Elementary. Go Welsh receives a number of awards for their art installation at the Fulton Theatre. 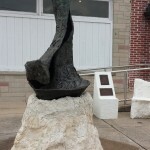 Visit the grounds of the newly renovated Fulton Elementary School, 225 West Orange Street to see the latest Poetry Paths artwork, by artists Sara Pevaroff Schuh and Erin Gleason. 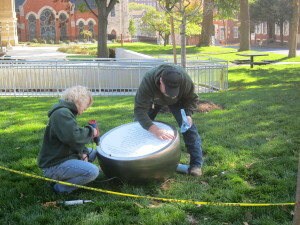 Below, Terry and Marianne of Irvin Services, the fabricators of the piece, have been on site preparing the stainless steel spheres and adding the Corian caps on which the poems are printed. 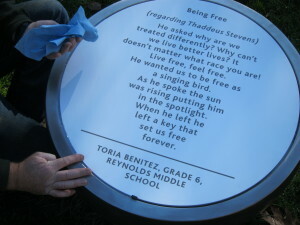 We are especially proud of this installment because it represents the thoughtful engagement of so many people in Lancaster, from the board of the Shreiner Concord Cemetery, who chose the poems and worked closely with the artists to develop the design, to the Board of the School District of Lancaster who welcomed the piece at Fulton. Congratulations to the artists and to writers Tim Seibles, Charles Bernstein, Alexandra Hill, and Toria Benitez. Alexandra and Toria were students in the school district when they wrote their poems, which celebrate the life and legacy of abolitionist and Lancastrian Thaddeus Stevens. 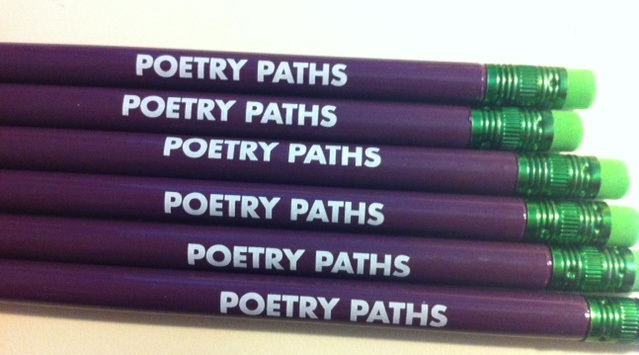 Poetry Paths in the Schools is underway for the 2013-14 school year! 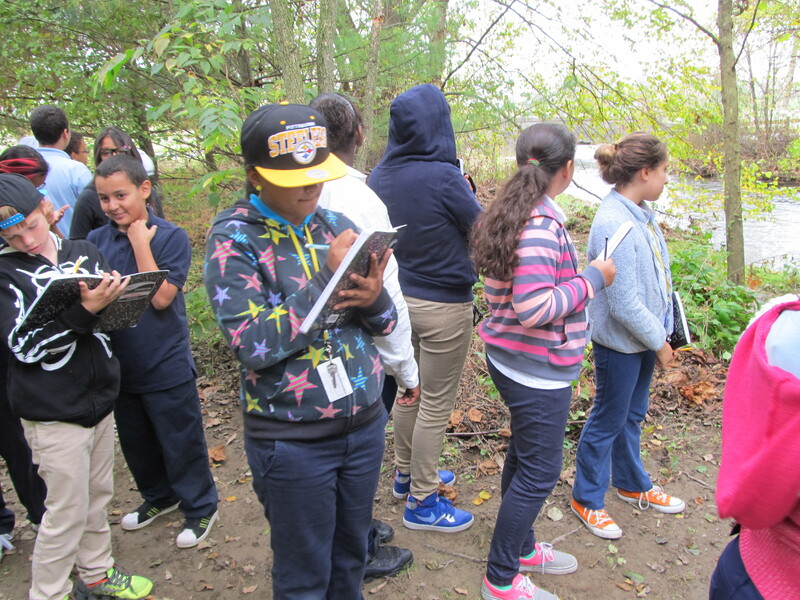 Students from Washington Elementary and Reynolds Middle School have been exploring the outdoors as inspiration for poetry. Washington Elementary visited the Conestoga Greenway and Reynolds Middle School (pictured here) visited the Millport Conservancy. Ross and Fulton Elementary schools are also participating. Keep a look out for updates! 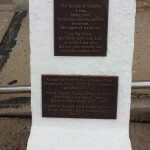 The new piece incorporates the poem Te Deum by Charles Reznikoff. 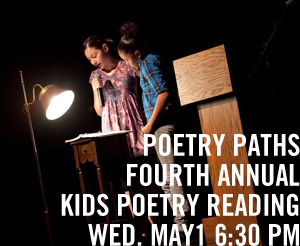 Please join us for our 4th Annual Kids Poetry Reading. 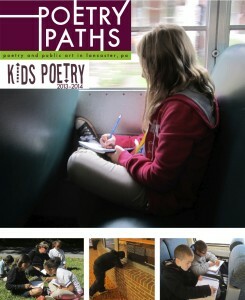 Our 2012-2013 season of Poetry Paths is coming to a close, and we write to invite you all to join us for our 4th annual Kids Poetry Reading. Please join the poets and their teachers, principals, friends, neighbors and families as we celebrate their art! 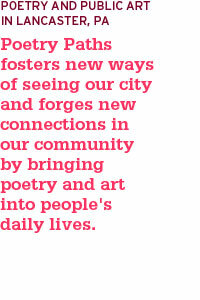 For the past four years we have worked with Barbara Buckman Strasko, our Poet in the Schools, to offer excellent poetry writing workshops to about 250 public elementary and middle school students each year. 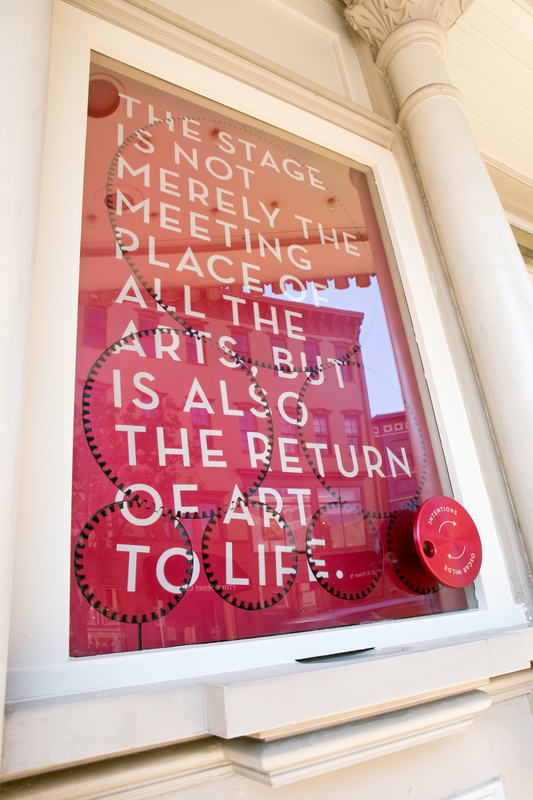 In preparation for the workshops, we also sponsor experiences for the students that give them a new and deeper appreciation of their neighborhoods, including trips to the Lancaster Museum of Art, the North Museum, the Lancaster Arts Hotel, and the Conestoga Greenway, among many other sites. At the end of each program year, we publish a journal of the kids’ poetry and host a large public reading of their work for teachers, principals, students, families, neighbors and friends. Since 2009, we have worked with a total of 1300 students from 17 public schools in Lancaster. Readings by 4th and 5th grade poets from Buchanan, Burrowes, Carter & MacRae, King, and Wharton Elementary Schools. 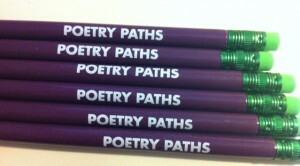 Thank you to this year’s donors to Poetry Paths in the Schools: Franklin & Marshall College; Gretel and Arthur B. Dodge, Jr.; the Armstrong Foundation; and the following companies who, by supporting Franklin & Marshall College via contributions through the Commonwealth’s Educational Improvement Tax Credit (EITC) program (www.fandm.edu/EITC), have supported Poetry Paths in the Schools 2012-2013: Frontier Communications; Fulton Bank; Oak Tree Development Group, LLC; Tomlinson Bomberger; and Warfel Construction Company. Portions of these companies’ donations have funded all the workshops, publications, and enrichment activities undertaken through Poetry Paths in the Schools. 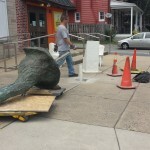 Poetry Paths, our innovative poetry and public art project, has reached critical mass with pieces now installed at Pennsylvania College of Art & Design, Tabor Community Services, Lancaster Public Library, Bright Side Opportunities Center, Spanish American Civic Association’s El Centro Hispano, Clipper Magazine Stadium, and Fulton Theatre. In celebration of our progress, we invite you and your families and friends to a free, public celebration of Poetry Paths. fun music, free food, and free pencils! 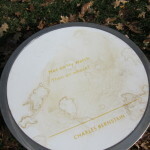 From 3:00-5:00 pm, come to the Ware Center, 42 North Prince Street, for your Poetry Paths Map and Kids Poetry Paths Kit, and then walk or drive to each of our completed sites, where volunteers will stamp your map and give you an insider’s tour of the artwork. From 6:00-8:00 pm at the Ware Center, please join us and the many people who have helped create the Paths for a free, public celebration featuring music by Vinegar Creek Constituency; food by Prince Street Café, Carmen & David’s Ice Cream, and Wendy Jo’s Homemade; mixing and mingling with our artists and writers, and the announcement of the winners of our Make Your Own Poetry Paths Art Project Contest, co-sponsored by Creative Works of Lancaster. Mayor Rick Gray and President Porterfield will speak.